A MAN has been remanded in custody after pleading guilty to assaulting three women at a house in Sandveien in Lerwick last month and stealing a car. 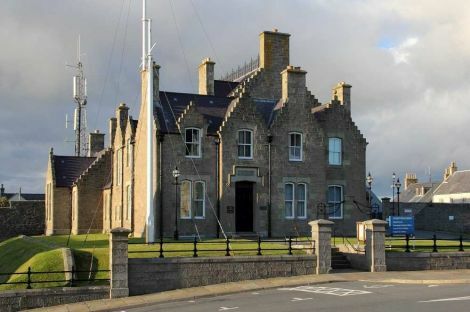 Ruairidh James Kavanagh, 24, whose address was given as St Osyth Road, Clacton on Sea, appeared from custody at Lerwick Sheriff Court after being arrested in England, having failed to appear in court for an earlier hearing. Kavanagh admitted grabbing one woman by the face, pushing her to the ground and repeatedly punching her on the head to her injury. He also punched another woman in the head to her injury and assaulted a third by repeatedly pushing her to the ground – all in the same violent incident on 13 October. Kavanagh also stole a car from outside the Dragon House takeaway on Kantersted Road on the same day and made off with a set of car keys from a separate address in Sandveien. Tommy Allan, defending, said that Kavanagh had faced threats and intimidation since his first court appearance and that continued on social media. He had feared for his safety and had moved south, where his circumstances had settled down. He had bought tickets for his travel to the court date on Wednesday, but when his father advised police of his intention of travelling to Lerwick, they intervened and arrested him. “That’s why he appeared from custody”, said Allan. Sheriff Ian Cruickshank said that he was “not persuaded” Kavanagh should be released on bail and remanded him in custody pending provision of a criminal justice social enquiry report, after which he will be sentenced.